This comprehensive application integrates the processes, information, and decision making requirements of promotional planning into one highly efficient common system. It supports all sales promotion vehicles and full reporting of financial results. A true innovator, our promotion planning solution can reduce time spent on current promotion activities by as much as 50 percent! Forecasting and promotion modeling are powered by Momentum Market Intelligence (MMI). The store-specific version of this parent application complements our headquarters promotion planning system. 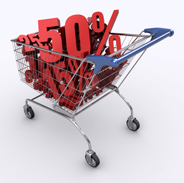 Retailers have estimated that margin improvements of at least one percentage point can be achieved with promoSuite. Typical promotion processes today have rampant inefficiencies and place extraordinary time demands on the category manager. promoSuite can reduce the time spent on current promotion activities by as much as 50 percent. The complete merchandising calendar for the entire year and the entire company can be developed in minutes with drill down and graphical views. Decisions are more comprehensive than just what is on ad this week, promoSuite allows promotions to cover multiple weeks with several different types of merchandising treatments and includes all vendor deals and funds. To achieve your objectives it is necessary to have a complete view of all promotions that impact the business. promoSuite provides comprehensive financial results across several different dimensions of the business. Year to date reports of budgets, projections and actual results provide information to keep the business on track. This includes monitoring of all vendor funds and deals. promoSuite maintains a data warehouse of actual sales and the complete set of causal conditions that influence customer demand. This information is the fuel for statistical modeling. promoModel provides forecast sales for defined promotions; simulations of several scenarios to select the best alternative; recommended optimal solutions given merchandising treatments; and finally, comprehensive total category modeling, providing for competitive brands and size cannibalization. A future release will be a store level thin client version of the headquarters promotion planning system. This will provide store managers with the same information as headquarters, as well as capabilities to implement store specific decisions with projected financial results. All store specific information is then available at headquarters.